NOTE: The RB750 is no longer in production and has been replaced with an improved equivalent, the RB750r2 aka hEX lite. 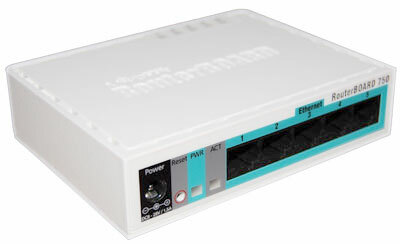 The ultra low cost Mikrotik Routerboard 750 comes complete with molded plastic case and power supply. RouterBOARD 750 with AR7240 CPU, 32MB RAM, 5 LAN ports, RouterOS L4, plastic case, power supply, in a retail box.